After finally, finally putting its Croce Di Pietro arc to bed last week (and let's just pretend that whole firework thing never happened), Touma's luck when it comes to getting entangled in misfortune doesn't seem to show any signs of changing as he briefly recounts his latest unlucky entanglements. Will this guy's luck ever change? Yes, it will as it happens, as the very next minute he finds himself winning the first prize in a lottery - a week-long trip to Northern Italy, no less. Probably not the best holiday destination for someone hated by the Roman Catholic church but hey, a holiday's a holiday, right? Certainly, it's too late to get any real grasp on this particular story arc at this juncture - most of this episode was simply fluff as it worked to get Touma to Italy and all of its pieces into position to kick things off properly. 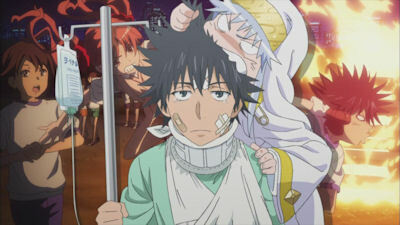 In light of its poor last major storyline I have to confess that my tolerance for such things has diminished quite considerably, but I suppose now is the time to take a deep breath, cross my fingers and pray that this time around To Aru Majutsu no Index II can actually deliver rather than bringing us to the brink of something exciting and then frittering it all away.